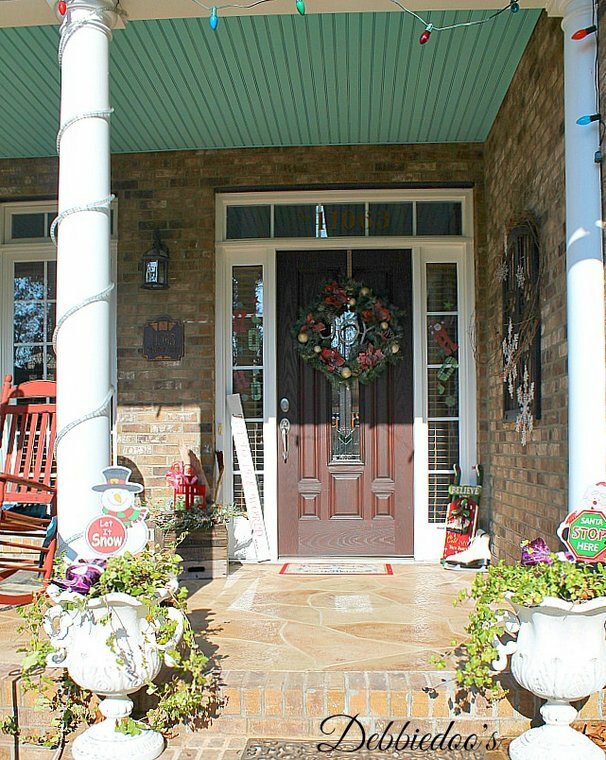 Four Super Inviting Christmas Porches! 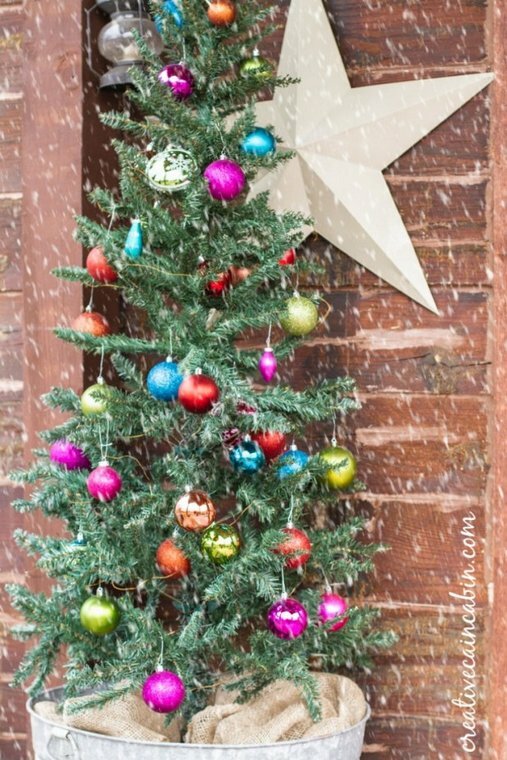 We are honored that four bloggers are sharing their outside Christmas decor ideas with us. 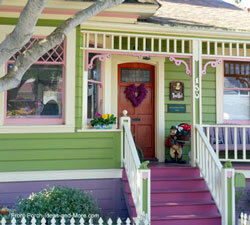 Their porches are whimsical, natural, inviting and colorful! You will get to enjoy Dawn's, Jane and Leos, Ann's and Debbie's Christmas porch decorations. So let us take a peek at what each of them did. What a treat! 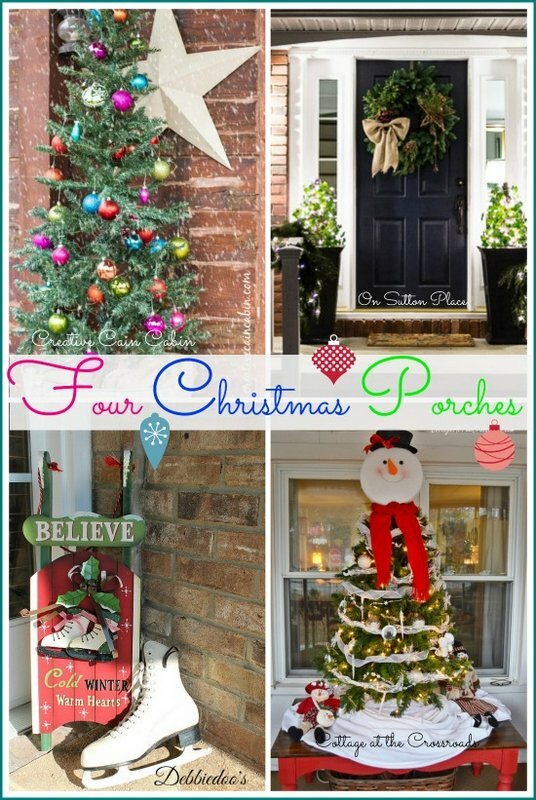 Four bloggers sharing their Christmas porches with us! We begin with Dawn's pastel Christmas porch. Actually it is beautifully done in gem tones. 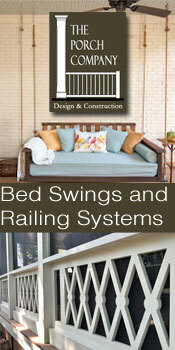 Dawn is the author of Creative Cain Cabin, an endearing blog with all sorts of rustic and country DIY projects. 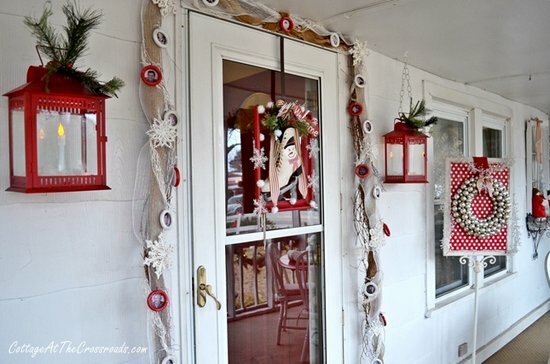 We enjoy Dawn's country cabin and how she decorates her porches year round. I knew I would love Dawn's Christmas decorations soon as I saw this tree. It's very old-fashioned looking - the shape and the gem tones of the ornaments. Perfect and nostalgic. A better view of Dawn's snowy front porch looking so vintage for Christmas. The red and white doormat is a cozy and colorful touch. 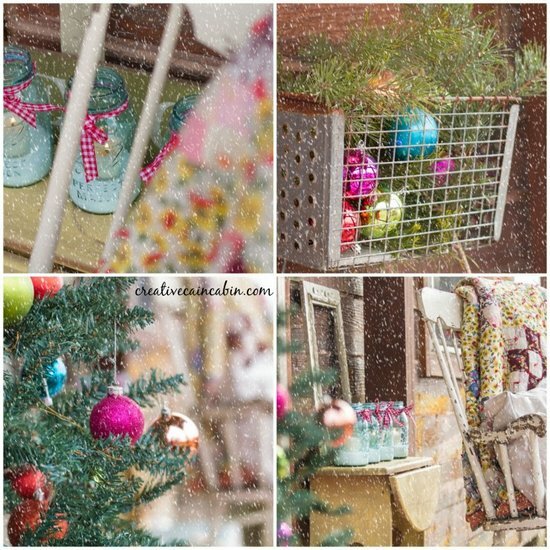 Do you see how she put pine branches and colorful ornaments into the wire basket on the wall? What a pretty exclamation point to her front entrance. Blue mason jars tied with red and white gingham ribbons - then filled with sand and votives. We like how she sat the vintage mason jars on a cute side table next to the rocking chair. If you like rustic and vintage, you will also enjoy Dawn's country fall porch that she shared with us. Take a look at how pretty! 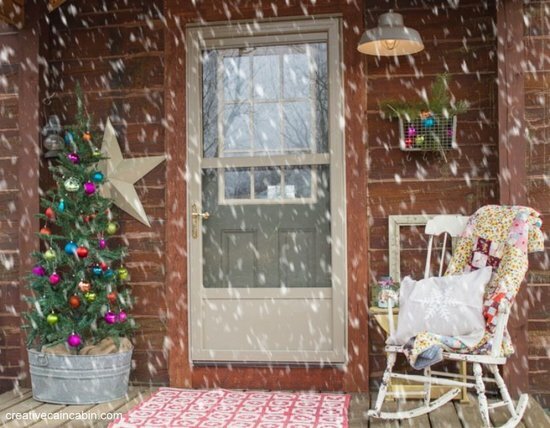 Please stop by Dawn's blog, Creative Cain Cabin, to see more of her Christmas porch. If you love simple country style, Dawn's blog is the place to be. You might just see some of your favorite things there. Jane and Leo, authors of Cottage at the Crossroads, are sharing their whimsical Christmas porch with us. Pretty red and white theme! Jane and Leo's South Carolina screened porch extends all the way across the front of their home. We especially like the red lanterns on either side of their front door. Jane says she will keep those lanterns on the porch year-round. The grapevine garland around their front door is sweet. If you look closely, you can see little round frames that Jane painted carrying the pictures of people who visit their home. How nice is that. 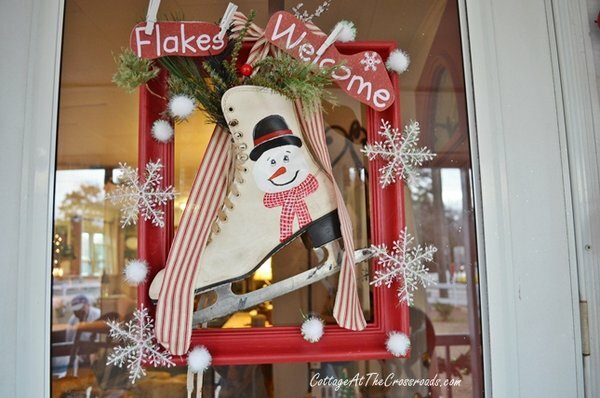 This is a super cute ice skate wreath that Jane made from a frame and a skate that she and Leo found at a flea market. See the painting that Jane did on the skate? That makes it extra charming. She also added some cute snowflakes to it. 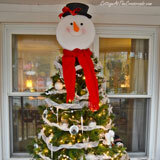 This sweet snowman tree sits on a table on Jane and Leo's porch. 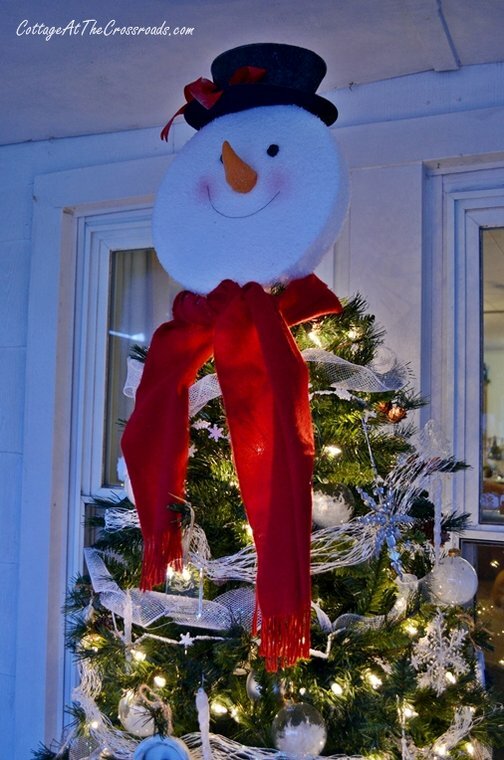 I have not seen a snowman tree this like before - he would bring a big smile to everyone who visits their home. Speaking of smiles, last autumn they also shared their autumn scarecrow porch with us, too. It's super cute. 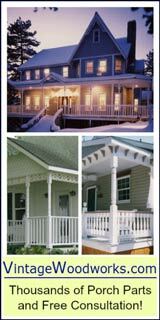 Please stop by Jane and Leo's blog, Cottage at the Crossroads, to see more of their Christmas porches. 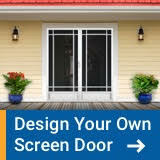 Jane and Leo are a husband and wife team who blog about their 100+ year old home and their journey in downsizing and enjoying their homestead. Now for another treat: Ann's Christmas porch. Ann is the author of On Sutton Place, which Ann describes as classic - vintage- farmhouse. Her DIY tutorials are beautiful. I love the clean yet rich look of everything that she creates. A while back we also featured her bittersweet autumn wreath. She is an amazing wreath designer so please take a look! 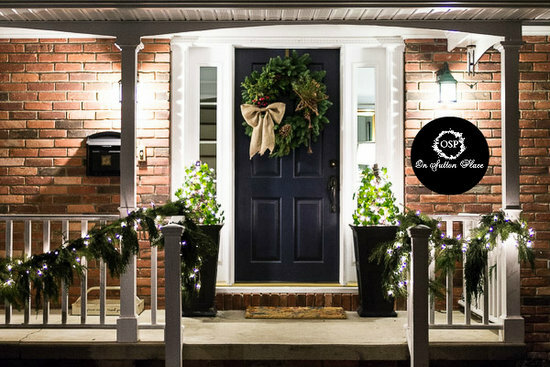 Ann decorated her porch this year with a fresh greenery garland and a gorgeous natural wreath on her front door. What a pretty burlap bow, too. Ann's front door is flanked by her signature ivy topiaries. Ann creates these lighted topiaries on her porch every year and we love them. 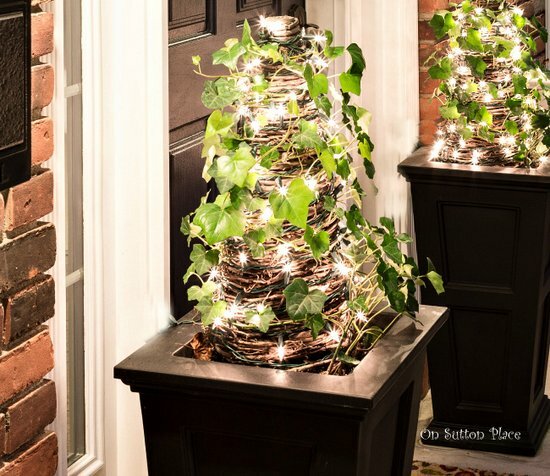 They are made from fresh ivy that actually lasts into December (even in northern Ohio where Ann lives). They look so fresh and sparkly. 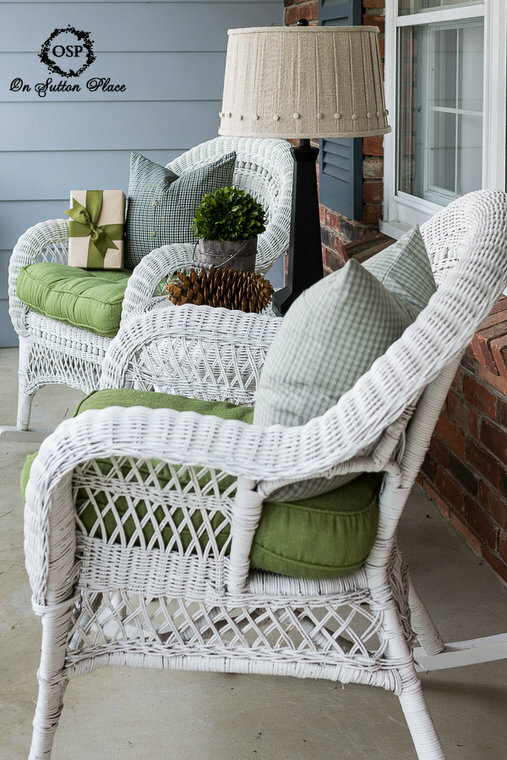 Ann's Christmas porch is decorated simply with muted green tones and natural elements like the large pine cone and the fresh green plant in the galvanized bucket. Do you see that pillow made from a shirt? Ann made that and it's a charmer for sure. 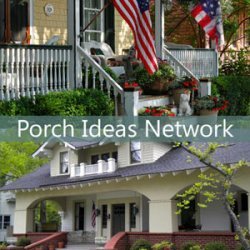 Please stop by Ann's blog, On Sutton Place, to see more of her Christmas porch and her wonderful tutorials on cooking, sewing and crafty projects. If you are looking for wreath ideas, tutorials, and outside Christmas decor ideas, Ann's blog is an excellent resource. Welcome to Debbie's Christmas porch! 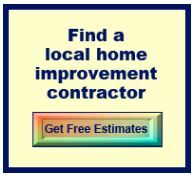 Debbie is the author of Debbie Doo's, a DIY and decorating blog that is light-hearted and fun. Debbie's delightful front porch is all set for Christmas. She used what she had from prior years and just changes it up from year to year. Debbie's decor is a mix of her own craftiness and dollar store treasures. Do you see the decals on the side windows? 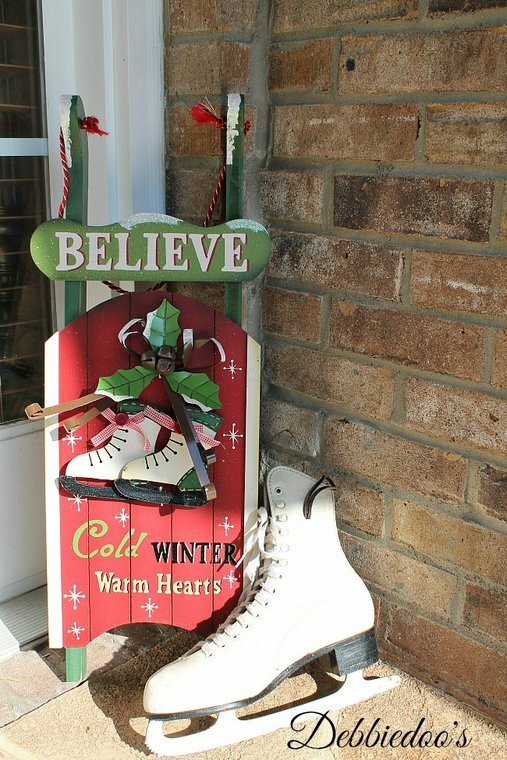 In the corner of Debbie's porch is this adorable sled and a figure skate - courtesy of her Mom. Next to the red lantern, there is a cute little reindeer that is made of bark from a palm tree. Debbie's porch is full of treasures here and there. 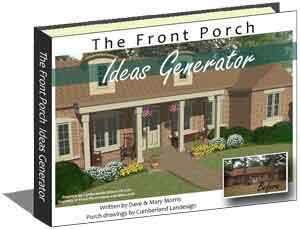 We know that Debbie enjoys porch decorating throughout the seasons. 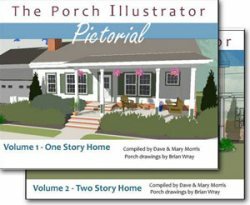 She shared her fall porch vignette and we had the opportunity to hear her thoughts on the fun of decorating a porch. 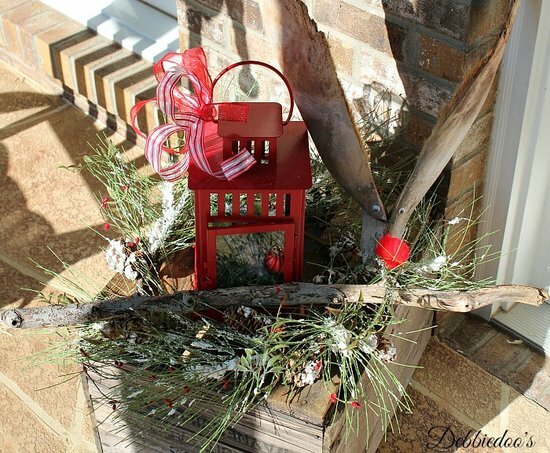 Please stop by Debbie's blog, Debbie Doo's, to see lots more pictures of her festive outside Christmas decor. 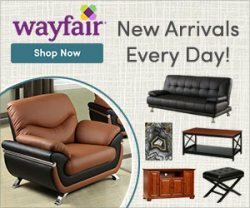 Debbie's blog is a haven of decorating ideas to make your home the coziest ever. Send us pictures of your outside Christmas decor or other craftiness for the holidays so we can share them here.